I think it is fairly clear from this blog that I love putting songs in conversation. There is a dialogics to popular music. Songs speak to us. They speak through us, as in the old practice of making mix tapes for people, where the songs complement and contrast with each other to express a variety of things to a friend or lover. But they also speak to each other, sometimes directly as is common on hip hop “answer records,” but sometimes indirectly, as when a song comments on a performer or a genre, in homage or in ironic takedown, or in relation to how the listener makes meaning from them. I put songs in conversation a lot these days, but it’s something I did even as a kid. 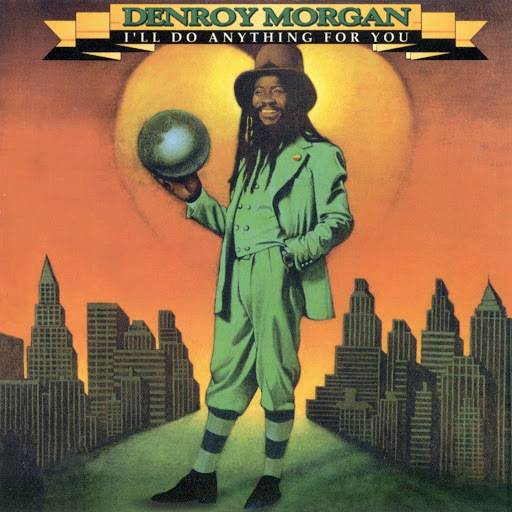 For example, take Denroy Morgan’s “I’ll Do Anything For You.” It came out in 1981. Not sure what month, but if I had to guess I’d say it was early that year because I already knew the song well when Hall & Oates’ “I Can’t Go For That (No Can Do)” came out in late fall and I remember thinking that the latter was a response to the message of the former. Now, there may be more cachet to admitting to liking Denroy Morgan than Hall & Oates. He is less well-known. He had fewer hits in the U.S. than that blue-eyed soul duo, and he got his start with famed NYC reggae band The Black Eagles, and “I’ll Do Anything For You” reached no. 9 on the soul charts and no. 7 on the dance charts, but when it comes down to it I am not familiar with any of his music aside from that peaking hit, and well…”I Can’t Go For That” is just a better and more influential song overall. The popularity of “I’ll Do Anything For You” meant that its frequent radio play, in addition to my brother’s eclectic DJing-driven tastes, helped 9-year old me to know the song well. It featured a little bit of a rapping breakdown, which in 1981 was still a novelty, and Morgan’s voice had that earnest strain that I still love. The song might be on the corny side, but as a kid I understood love to be just the kind of thing Morgan was singing about—doing anything for someone, being totally devoted to them. Plenty of other love songs and the conclusions of movies reinforced this. “I Can’t Go For That (No Can Do)” is from 1981’s Private Eyes album. But when I heard Hall & Oates sing “I Can’t Go For That (No Can Do)” I was immediately fascinated by it—confused by its hesitation and willingness to admit to a conditional kind of love. As Musical Youth and Donna Summer would sing in 1983, “Give me your unconditional love” is a more common sentiment, or at least it seemed to me at the time. But even more amazing to me was that Hall & Oates seem to be directly challenging Denroy Morgan’s song. I mean, how could a song reference the line “I’ll do anything that you want me to” and not be referring to what was a very popular song at that time? The fact is, I don’t know when Hall & Oates wrote their song. Chances are, based on how closely they came out, that the later song was created without knowing the earlier song even existed, but the connection was not hard to make as they were on the radio at around the same time. Heck, it is so strong a connection, I can’t help but wonder if Hall & Oates benefited from the popularity of Morgan’s song when theirs came out. In other words, I couldn’t be the only person who put these songs in conversation. I couldn’t be the only person that heard Daryl Hall’s sweet voice (Lord, I love that man’s voice) as a slick retort to the rough edged earnestness of the disco-inflected reggae of Denroy Morgan. Actually, I guess I know for a fact that I was not the only one who thought this way, because I remember my brother playing the two songs together, cross-fading between them, pitching up “I Can’t Go For That” just slightly even as he slowed down “I’ll Do Anything For You” in order to get their beats to match and create what we’d call a mash-up these days—a mix where the songs built on each other, spoke to each other—Hall and Oates blue-eyed Philly soulful snark kind of spitting at Morgan’s rootsy New York City pop reggae, even as the latter drew you to dance. “I’ll Do Anything For You” is from an album of the same name. My young imagination was also probably piqued by the sense of mystery of the Hall & Oates song. I mean, what exactly can he not go for? There is something both insidious and subversive in the idea. Morgan’s song, while fun, seemed to already know the answer to any question or any request. “I Can’t Go For That” gestured towards adulthood with unknowability, the gap of desire begged to be filled. A few years ago I learned that Hall did not mean the lyrics to be about a lover at all, but referenced the record industry. At least, that is his claim. I still hear it as a kind of anti-love song. Hall & Oates used a Roland CompuRhythm 78 drum machine on the “Rock & Roll 1” preset for this track, and that awesome bass line came from Korg organ using whatever sounds, and it may be the first song to hit no. 1 on the R&B charts to use a drum machine. In that way, it pre-dated a lot of music to come after it. Even Michael Jackson admitted that he lifted the groove for “Billie Jean,” but Hall & Oates are the type of musicians who like it when they are sampled and used by other artists. I respect them for that, not only because of my own views on how creativity works on building and recycling the work of others, but because I think for a couple of white guys who made their living riffing off black music to not willingly share their music with others would be kind of fucked up. 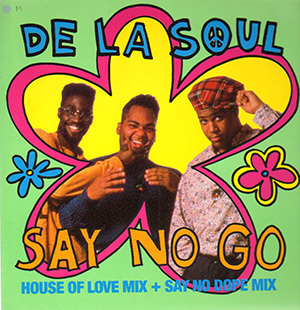 “Say No Go” is from 1989’s 3 Feet High and Rising. 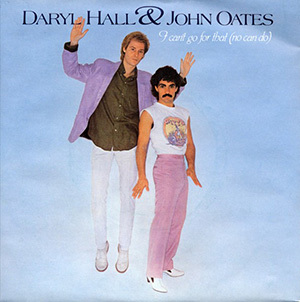 I think it also bears mentioning that Hall & Oates’ song was from an era where music crossed over to black radio play from white artists in ways that does not seem to happen today. In fact, whenever the word “crossover” is used it basically always refers to black musicians entering into the mainstream radio play. It is because of this that I take issue with Elisabeth Wheeler’s reading of De La Soul’s sampling of the song for their own track “Say No Go.” In her article, “”Most of My Heroes Don’t Appear on No Stamps”: The Dialogics of Rap Music,” which appeared in Black Music Research Journal way back in 1991, she calls “I Can’t Go For That” “the cheesiest pop song imaginable” (200) and claims that producer Prince Paul use of the sample for a song that tells the tale of crack babies is an example of the dialogics of rap music, bringing out meaning from the “blank pastiche” of the corny. I think the use of the song is certainly an example of these dialogics, but when she goes as far to say, that “If De La Soul can find a use for Hall and Oates, then absolutely nothing has to go to waste,” she is forgetting that DJs and producers usually have a deep respect for the sounds that borrow, bend and put to new use. Her misreading of the song, calling it simple “crooning” to Daryl Hall’s “beloved,” reveals a greater desire to castigate what De La Soul clearly heard as a cutting, but soulful song making its own comment on the narratives of mainstream love songs, than in hearing how they might be putting that twist to further and sharper use—both songs play with expressing a rejection of a destructive desire. It is amazing to me that Wheeler goes on to quote Afrika Bambaataa’s well-known desire to always push people to groove to music they claim they don’t like. He didn’t want to catch them dancing to this music because it was bad, but because he heard it as good regardless of genre, original audience or original use. Dialogics represent the rejection of a finality of meaning. It moves back and forth like a crossfade, bringing new voices to bear on the conversation, layering and embedding them in other voices to make room for more. “do-do-do-do anything!” There certainly is a kind of urgency there with Morgan’s beg that is lacking with the white soul singer’s cool rejection lyrics. What does it mean? I like that you easily put these song themes in dialogue with each other, but I am also interested in what happened between the time of “white crossover to black,” which was fairly common in the 80s as I recall, in contrast to the 90s and thereafter, when it flips? It seems to me that there is an effacement of racial boundaries that occurs, but I can’t account for it, knowing so little about this stuff. I would love to hear more, this is great. I’d love to account for that flip as well. I am no sure, except that at some point the degree to which black people were assumed to only listen to “black music” increased dramatically even if the actual segregation of listening habits hasn’t to the same degree. I am reminded of last year (year before) when a black couple was “surprised” on Jay Leno at a gas station and asked to sing and there was some buzz online astonished that they were familiar with songs by Bon Jovi and the Eurythmics, etc. . . I am not sure what that means, but I am also reminded that on Buhloone Mind State there is a song that addresses “crossing over” and the question is asked “How come no one ever crosses over to us?” – But I think it did used to happen. I mean think about how infrequently black rock groups are popular these days.